In the pivotal summer of my youth, I was hanging out at Expo 67 in Montreal, the “Sixties” were in full flower, and I was discovering, well, just about everything. It was a wonderful time to be young. At some point, I read On the Road. It changed my life. Kerouac’s hypnotic, stream of consciousness saga about living without restraint, about embracing the whoop of going somewhere, anywhere, bore right into my sweet, embraceable soul. A week later, I was on the road, myself. A buddy and I stuck out our thumbs, headed for my hometown of Newmarket, 500 kilometres distant. Innocents both, we had no idea that two guys hitch-hiking together is roadside death. It took 17 long hours, but I loved every minute of it. Our last ride, right to the door, came from a dope-smoking Yorkville denizen, who’d been driving around outside Toronto to avoid being stopped by the city cops. My mother, bless her, made us all breakfast at 5 a.m. Eventually, however, it wasn’t safe. Good rides were harder to come by. I was particularly spooked by the death of someone I knew from Newmarket. He died on the road in Northern Ontario, when a drunk driver who had picked him up drove off the highway. Sometime in the late 70’s, during a Prince George snowstorm, I hung up my thumb. 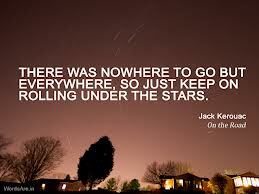 On the Road may have done in Jack Kerouac, too. The fame resulting from his best-selling book and the media’s insatiable thirst to focus on him as “king of the Beats” turned him inward. He became a reclusive alcoholic, his personal life a mess. 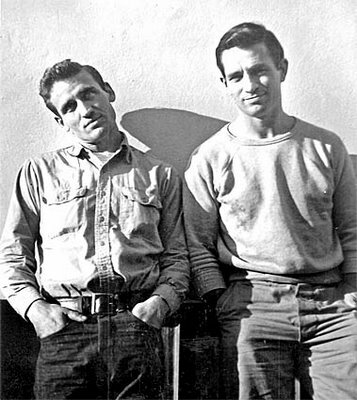 I’ll never forget a picture of Kerouac published in Ramparts Magazine shortly before he died at the tragically early age of 47. Seated beside his mother, he looked old, ravaged by booze. I saw nothing of the man who set my boot heels wandering. Still, even after Kerouac passed on, and before him Neal Cassady, the legendary but tortured “holy goof” who inspired them all, I retained my fascination with the Beats –Allen Ginsberg, William Burroughs, Kerouac, Cassady, and the other beatific non-conformists who didn’t get the same prominence. It was life and words from the wild side. Their influence was profound, albeit outside the mainstream. And now, there’s an added attraction. Just across the way from City Lights is The Beat Museum, run by Jerry Cimino, an affable, talking encyclopedia of the Beats and what became of them. When I popped in recently, it was just a few days after the death of Carolyn Cassady, Neal’s wife, Jack’s lover and one of the last personal links to that wild and crazy time. She had visited the museum. Jerry was quoted in many of her obits. “A great lady,” he told me. The main floor contains a pretty good bookstore, with many Beat reprints and counter-culture originals. I was delighted to see Canada represented by a first edition of Voices From the Sixties, “collected, arranged, annotated and edited” by Pierre Berton. There is also Allen Ginsberg’s portable typewriter, plus a small theatre featuring a film stitched together with experts, those who were there and some vintage footage of Kerouac trying to explain the Beats to befuddled interviewers. Up the backstairs on the second floor is the real museum. There’s not a ton of stuff to see – letters, first editions, blown up photos, movie posters, newspaper stories, artifacts, memorabilia, reminiscences, etc . Nevertheless, the museum does a good job of evoking the Beats and their cultural significance, even if I did come away with a renewed sadness that so few lived to a ripe old age. Worth the $8 admission. I was glad I went. Just don’t expect the Louvre. 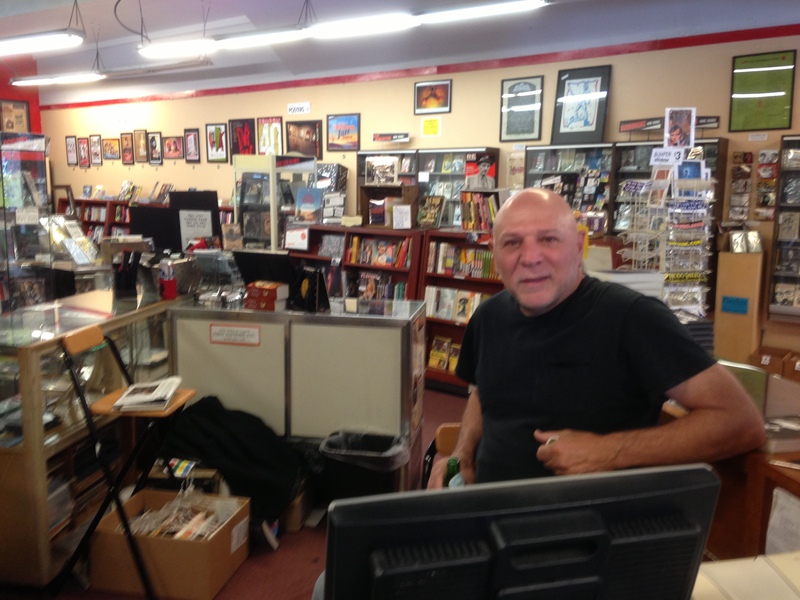 Jerry Cimino, manning the till at The Beat Museum in San Francisco’s North Beach.